The SPTE33X & PTE33X are two innovative power pallet trucks with a 48V system designed for light-duty applications with 3300lbs capacity. These revolutionary products are the best valued power pallet trucks and were designed in order to eliminate the labor involved when using the traditional hand pallet trucks. Their compact design is ideal for use in tight spaces such as elevators, trailers, containers, as well as retail stores with narrow aisles. 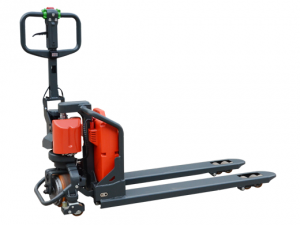 Both of these powered pallet trucks are equipped with an easy lift-up, interchangeable battery pack.